Perfectly Created Chaos! : Gotta love new stamps! Remember to ***Read about my blog candy***!!! Lots of stuff to give away. I hope you all had a great weekend and a fabulous mother's day. Mine was absolutely perfect. I got my traditional breakfast in bed with gifts and flowers. It's the only day of the year my husband cooks for me and it's always an omelet and toast; and it's always the best omelet in the entire world!! Then we spent the rest of the day with my sisters, my mom and the rest of my family. I got a chance to do the OCC challenge this morning. The sketch has an oval in it. (I really need to get some sort of oval cutting device!) I decided to replace that with a square piece with rounded corners. I also used my brand new stamps from Our Craft Lounge. This set is called Garden Thoughts and it is so pretty! I love it and I can't wait to play with the rest of it. I noticed the other day that I had a ton of Really Rust cardstock that I had not used in a while, so I decided to build the card around that. 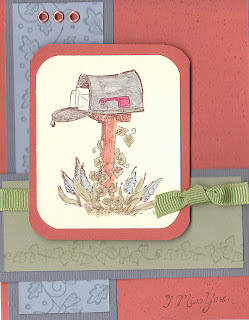 I chose Bordering Blue, Mellow Moss and a piece of Bazzil textured cardstock for my colors. I stamped the mailbox main image in cocoa ink and then used my watercolor pencils, blender pens and markers to color it in. I used my color spritzer tool on the Rust background before adding each of the layers. Nothing really fancy; but I like the way it turned out. So, that's all for me today. I plan to work on some layouts and also try to do the Mojo Monday sketch as well, which I will post tomorrow morning. Have a good day and thanks for visiting with me! I like the color combo on this one! Nice take on the sketch. Very pretty! I love the soft looking colors!! Glad you had a great Mother's Day!! SO did I!! Very cute card! I love the colors you used! i"ve got blog candy too!